The report from the Croydon Local Independent Review Panel has just been published (Tuesday 28th February). Click here to access a copy from the Croydon Online website. “The issue of protectionism was raised with regard to shops on London Road by a number of people who met with the Panel. This issue was also raised with the Metropolitan Police Service and there was an acknowledgement that this was happening. The Panel heard of specific efforts made by Croydon Police to tackle this issue and difficulties that had been encountered when doing so. “Other longstanding issues of crime and disorder were repeatedly raised to the Panel regarding North West Croydon, including drug and alcohol crime, gang crime including gangs based on ethnicity, street crime and fear of reporting crime and reprisals. That the South London and Maudsley NHS Foundation Trust be encouraged to work with other agencies and the local community to bring the vacant Croydon General Hospital site back into use as soon as possible. The dead space of the old General Hospital site has been an ongoing blight on London Road for many years, but with suggested schemes and land use coming to nothing, more than ‘encouragement’ is likely to be needed…. That the Metropolitan Police Service gives consideration as to how a more visible policing presence can be provided in the North West Croydon area including London Road. That considering process has been going on for a while with few effective solutions. Traders still complain about the low-level but regular aggressive pilfering which goes on from their shops. That the Metropolitan Police Service prioritises the rebuilding of trust and understanding between itself and young people and young adults in Croydon. That the Government reform the processes by which payments are currently made under the Riot Damages Act in order to achieve quicker payments for persons claiming under that Act. That the local Community Safety Partnership undertakes detailed analysis of the profiles of persons convicted of rioting in Croydon to provide further understanding of who rioted in Croydon and why. That the Council’s policy of promoting internal shop shutters be implemented. “Most of the government money pledged to help small businesses after the riots is unlikely to be paid out, according to a BBC assessment of claims. “Some £20m was allocated to the High Street Support Scheme, but businesses have been slow to claim the money through local authorities. 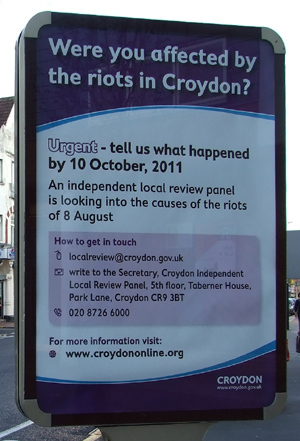 Croydon has set up a Local Independent Review Panel to look into the riots in Croydon on 8th August. The panel of five people is being chaired by William Barnett QC and will submit its findings to the national Riots Communities and Victims Panel. 1. To contribute local evidence to the National Communities and Victims Panel. 2. To examine why the civil disturbances/riots took place in Croydon, to record and place on the record what happened and how the various regional and local agencies responded. 3. To assemble written and oral information, review and sift relevant data. 4. To provide a summary of lessons to be learnt for the avoidance of a recurrence. 5. To make public the findings of the review and any recommendations. 6. The time frame for completion of the work of the Panel is up to five months. Submissions must arrive by Monday, 10 October, 2011, in order to be considered by the Panel. You can also submit your evidence and views direct to the National Communities and Victims Panel – click here for details. 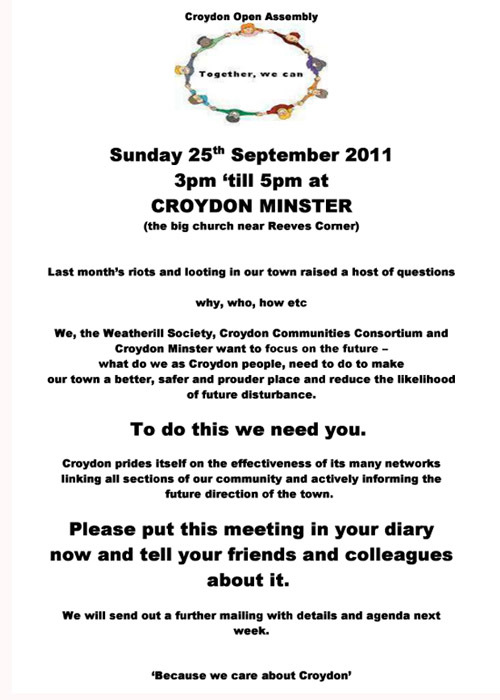 The Weatherill Society, Croydon Communities Consortium and Croydon Minster are holding a Croydon Open Assembly at Croydon Minster on Sunday 25th September. All are welcome – let’s make sure that London Road residents, traders and businesses are well represented. The Riots Communities and Victims Panel has set up its website and put out a ‘national call for evidence’ to help understand the causes of the riots in August. From week beginning the 19th September, the panel will travel around the country to meet people and hear their views face to face. Letters are being sent to communities and organisations across the country to ask people to come forward with their views. or by post to: Riots Panel, 6th Floor, Eland House, Bressenden Place, London SW1E 5DU. Let us know if you are invited to a face to face meeting with the Panel – we will also put an update on this website once we know the Panel’s schedule. ~ what they think could have been done differently to prevent or manage the riots. The Grassroots Communities and Victims Panel has been created by the Deputy Prime Minister to listen to the views of those affected by the recent riots – residents, shopkeepers, parents, young people and others. The terms of reference state that “the Panel will give those affected the opportunity to voice their opinions on the factors which communities believe led to the loss of public order and rioting in their areas”. If you want to put forward your views or suggestions on any of the points listed, get in touch with your local community group, Croydon Council or Croydon Voluntary Action as soon as possible. Click here for links to their websites. You can also get in touch with us. A series of “Question Time” meetings for anyone affected by the riots, organised by Croydon Council and the Police where people can talk about the disturbances, and about working together on Croydon’s recovery. If you can’t get to those above, there are other meetings (in Norbury, Thornton Heath, Purley, South Croydon etc). See the full list on the poster (right). For more information, see here and here on the Council website.